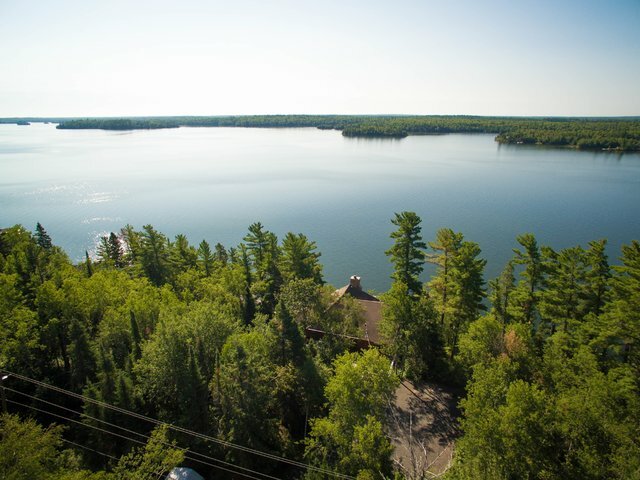 This open concept year-round cottage is situated on a 1.875 acre lot with 202 feet of deep water frontage that is owned. The property hosts 7 bedrooms with 4 bathrooms and offers a total living area of approx. 3600 +/- square feet. No attention to detail was spared in the design and construction of this wonderful lakefront retreat. The English hip-roof design allows for a grand open concept main floor with stacked stone fireplace and offers breathtaking views from the living room, dining area, sun room and attached south-facing deck. On the main floor you will find the master bedroom with an en-suite, second bedroom that has an attached 3 piece washroom that shares space with the main floor laundry room. There is also a 2 piece powder room located on the main floor. The three season screen room is also located on the main floor and takes in views of the lake. On the lower level you will find three more bedrooms, family room and a fourth bathroom that also leads to a walkout hot tub area or straight to the rooftop patio over the boat house. A two bedroom sleeping sleeping cabin is located beside the cottage and has its very own sitting deck looking over the water and offers excellent privacy for family or friends for those long weekend events. The triple stall boat house has a large rooftop deck along with plenty of additional parking for guests. Water depths off the dock/boat house are around 17 feet so excellent for swimming and mooring boats. The cottage is heated with a dual zoned high efficiency propane furnace and baseboard heat for backup. There is high speed internet, monitored alarm system, septic tank and field and satellite T.V. Being offered fully furnished with all major appliances. All that is left to do is plan your first meal and decide which clothes you are going to bring! Inquire today!